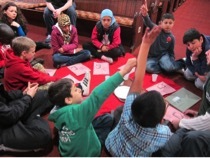 This is a fun-packed weekly after-schools kids club for children in school years 3-6. Packed with fun, crafts, games, Bible stories, quizzes and lots more!!! Bridge also runs a five day holiday club in the summer with even more activities including drama, big games, quiet games, Scalextric and loads more.